What does the Jesus of the New Age book A Course in Miracles teach? Dr. David Reagan and I were delighted to have as our guest on Christ in Prophecy Warren Smith, the author of the book The Light that Was Dark. This fascinating book tells Warren's touching story of how in his search for a Savior he got sidetracked into the occultic darkness of the New Age Movement. From his many years of experience under that influence, Warren now has dedicated his life to warning Christians about the dangers of the New Age and help us recognize how we can avoid these satanic influences from creeping into our churches. 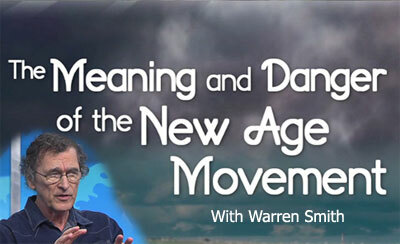 Warren Smith: Because of a number of seeming coincidences that were being laid out in front of me, the result was that I then got very involved in the New Age. I started doing meditation. I got involved with the Rajneesh Movement. I was a fairly day-to-day social worker in my regular life, until all of a sudden I am dyeing my clothes orange. I even dyed my socks orange. I was in a state! Dr. Reagan: You were showing up at work in orange clothes? Warren Smith: More than that, I put my desk on the floor and I had a picture of Rajneesh over my desk. My boss was so dumbfounded that it took him 30 days to order me, "Get that desk out of here!" I was like the token spiritual guy in the office, and I was bringing all this new stuff in. This was fairly early New Age. This was like the early 1980's, so I'm dating myself. So, I got involved with Rajneesh. In the New Age you sort of move into one thing and then you move into another, and everything piles together. Even though you might be involved with a psychic or a guru or the book A Course in Miracles, which was my next step, you discover that all the bottom lines are the same. You are taught that God indwells His creation. God is in everyone and everything. That's the bottom line of New Age teachings. Concerning how I got involved with A Course in Miracles, it's very important that I explain this, because people need to be aware of this deceptive book. Oprah Winfrey long has been pushing it very strongly since 1992. I heard one Christian figure say that, "Oprah has been involved with so many different things that she doesn't really know what she believes." Absolutely untrue! She absolutely has a bottom line, New Age philosophy that she's been outing for years. All these New Age teachings all fit together. Everything I did fit together. A Course in Miracles is a book that claims it is new revelation that was supposedly delivered by Jesus Himself to a female psychologist in New York City at Columbia Presbyterian Hospital. Helen Schucman claimed she heard an inner voice saying, "This is a course in miracles. Please take notes." So, for seven years she took down the notes. It was a whole new philosophy about life. It was a whole new religion, if you will. It was New Age Christianity, though really, there is no such thing as New Age Christianity. That's an oxymoron. This Jesus of the New Age I had accepted because all these various teachings came to me all in the same way. I was handed a book by Gerald Jampolsky called Love is Letting Go of Fear in a massage practitioner program that I was in. This book had all sorts of little spiritual stuff that really felt good. He said in it, "Everything I am telling you in this book was inspired by A Course in Miracles." Reading that is what made me go out and get A Course in Miracles and start to read it. The Jesus of A Course in Miracles, through Schucman in her writings, says the following things and they are not true. "The recognition of God is the recognition of yourself." And, "The journey to the cross should be the last useless journey." Remember that Oprah Winfrey has said these teachings from A Course in Miracles can change the world. Nathan Jones: And you bought into all of this? Warren Smith: Yes, as I had no reason not to. I thought it was new revelation. I thought there really is a Jesus and He's bringing these things to a world that's in trouble. Dr. Reagan: Deception is almost always done in the name of Jesus. Warren Smith: All in the name of Jesus, right. Another thing the Jesus of A Course of Miracles said was, "Do not make the pathetic error of clinging to the Old Rugged Cross." These things I know now are total blasphemy to believers in Christ, but somebody who doesn't know what happened on the cross wouldn't know that Jesus died on the cross for our sins and to defeat the Devil. I just accepted the lie ignorantly. Then, there was a most interesting statement this New Age Jesus claimed, "There is no sin. There is no evil. There is no Devil." Okay, with that you have pretty much turned the Bible upside down, and all in the name of what? Love. It's all done in the name of love. The one spectacular heresy that this New Age Jesus said that is really significant, especially to today, is that when this Jesus was asked, "Are you Christ?" He responded, "Yes, and along with you." Nathan Jones: That's back to that old Garden of Eden lie from Satan that we can all be gods. Warren Smith: We are all God, and we are all Christ, according to the New Age Jesus. He teaches we save ourselves by recognizing that we are God. The only thing satanic is to not believe in your own divinity. Warren Smith: Oprah Winfrey has also said that these teachings can change the world. She actually had A Course of Miracles, taught on her radio program daily over a year by Marianne Williamson. Dr. Reagan: So, you are really saying that Oprah is rather the high priestess of the New Age Movement? Warren Smith: Oprah Winfrey has been outing everything that I was involved in probably since 1987, so it's credible. Nathan Jones: She has the biggest audience of almost any media person, right? Warren Smith: Yes. She has brought on one Betty Eadie who actually made her way into the Church with Embraced By the Light, a book that came out I think in the early 90's. She had a near death experience. This Betty Eadie began actually as a Mormon until becoming a New Age woman, the she's always presented herself as a Christian. She said that in her near death experience she was told that God was in her, in the plants, and everything, God indwells His creation. Sadly, her book Embraced By the Light was in Christian bookstores and received quite a bit of attention. I even read it, though from a critical standpoint, because by that point I was a believer by the early 90's. Dr. Reagan: You got really involved in A Course of Miracles, even as a teacher, didn't you? Warren Smith: My wife and I, though she was my girlfriend at the time, were in one of the early course groups of A Course of Miracles. Every Tuesday night we would get together with our teacher and we would study A Course of Miracles. We didn't realize that the book was the Bible upside down, all written in the name of love, peace, and happiness. I want to say to those who don't realize this, but the Bible says that Satan comes as an angel of light. First Timothy 4:1 warns about seducing spirits. I realized later that Helen Schucman had been seduced by this voice saying that it was Jesus. In the psychic reading, the ball of light was Satan coming as an angel of light. When I was into the New Age, we were riding high. We were holding workshops in our town. We were teaching A Course of Miracles to anybody who would listen. I was running around my workplace where I worked with developmentally disabled clients like people who had autism and were at that time given the term "mentally retarded" or "developmentally disabled" now, and I would have these guys doing Sufi dances at the shelter workshop. The director of the shelter workshop would look out the window at lunch and see me all dressed in orange with all the clients dancing around. They would wonder, "Oh, my! What's going on out there?" Here I was telling everybody about A Course of Miracles. I was an evangelist for the New Age. There are so many people out there who were just like me, though they might not be dressed in orange. A lot of us who were involved with Rajneesh, and a lot of them were doctors, lawyers, businessmen, and very successful people like CEO's, they are now the people who are running all sorts of New Age programs out in the world, but they are dressed normally. They work in Silicon Valley and they live by this philosophy. Steve Jobs has actually gone to India and was very involved with New Age teachings when he was alive. In the third part of Warren Smith's fascinating testimony of how he was saved out of the New Age Movement, Warren shares his scary encounter with a demon.